The Gill Man Saves! 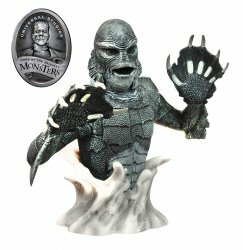 This 8-inch Creature From the Black Lagoon Bust Bank in Silver Screen finish (B&W) helps any fish out of water save money while paying tribute to one of the most iconic Universal Movie Monsters of all time! 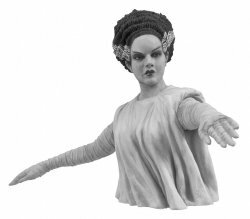 Frankenstein Bust Bank and others available separately. Collectors Note: This is the B&W Silver Screen version. These cool vinyl banks were featured on display at the San Diego Comic-Con and are very well done. Comes bagged not boxed from the manufacturer.